The Sentry Keys product consists of two specialized keyboards that supplement the standard personal computer keyboard. These rugged keyboards are intended to improve operator efficiency by providing faster access to common features otherwise available only by mouse or keyboard operations. The Sentry Keys product is available for use with Spectrum SentryNet™. The first keyboard is pre-programmed with hot keys appropriate for operating radio receivers. The hot keys are designed to provide rapid access to common functions such as tuning, mode, audio recording and playback functions. 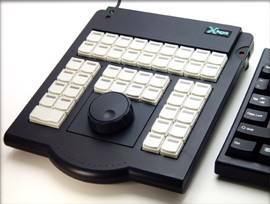 Additionally, the first keyboard includes a tuning knob and a tuning jog dial. The tuning knob acts like the tuning knob of a real radio, and rotates continuously in both directions. As the operator rotates the tuning dial, the frequency in the radio is adjusted. The tuning jog dial allows the operator to quickly tune up or down in frequency. The speed of tuning is proportional to the degree of rotation of the jog dial. The jog dial is spring-loaded, and returns to the zero position when released. The second keyboard is used for direct entry of frequency, tuning step and bandwidth. 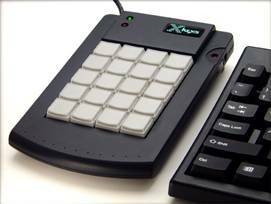 A standard 10-key data entry pad is included, as well as direct entry buttons for MHz, kHz, bandwidth and tuning step.